Most kids give a pretty standard answer, “A policeman,” or “A ballerina,” or “Superman,” and they stop there. Not my child. And I bet, if you’ve been reading faithfully over these past 20 days or so of the Write 31 Days (or if you just read the title of today’s post), you can guess which one. Oh, Elijah. My bright, imaginative, curious, optimistic dreamer. 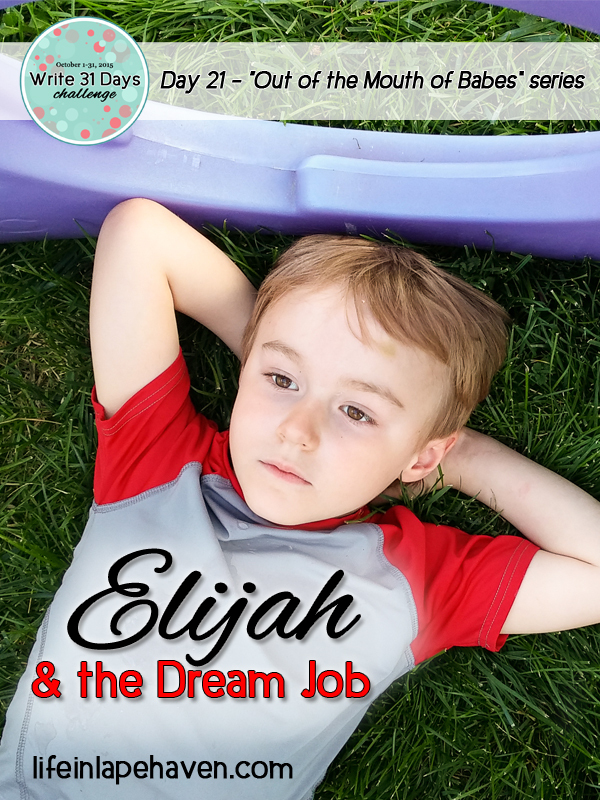 Do you know what HIS standard answer is when he’s asked what he wants to be when he’s older? He tells people that he wants to be “everything.” And this has been his standard answer for the past 2 years, at least. Of course with that answer, he always expounds a bit, clarifying his “everything,” in case anyone wonders what that means exactly. These are just some of the occupations that he says fairly often, but it is by no means a definitive list. He adds new ideas regularly to his “everything” dream job. As a mom, I’m both amused and amazed. He could totally be a lot of those things at once. In fact I know someone who has been a daddy, a preacher, a firefighter, and somewhat of a farmer, all at the same time, so it’s possible. 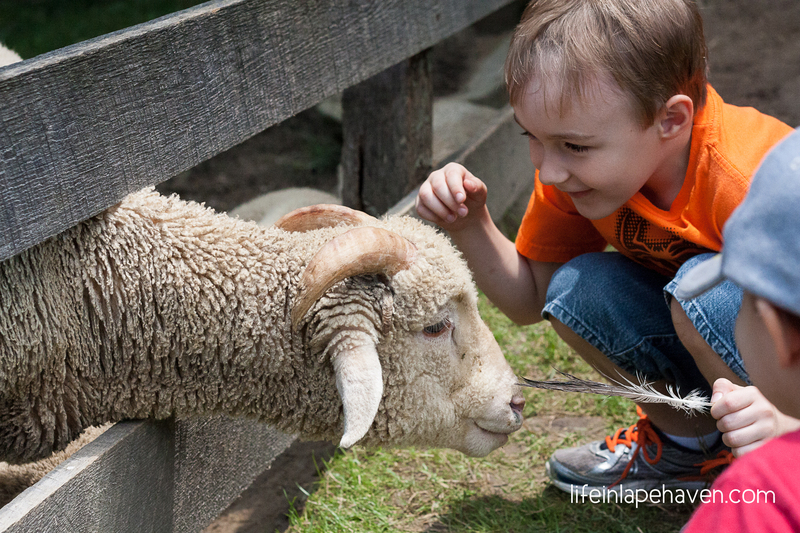 But to shepherd a heart that dreams so big is kind of intimidating. All I can do is pray that God leads his steps and gives Brad and me wisdom as we raise him. Pray that we lay the foundations solidly for his own relationship with God so he can follow God’s leading closely. Pray that we notice his talents, giftings, and strengths so we encourage them and pinpoint his weaknesses and challenges so we can help him overcome them. 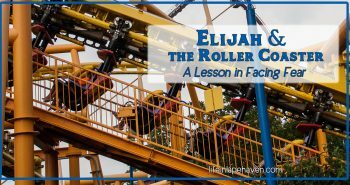 Pray that he does his best to reach his full potential and fulfill all the plans that God has for him, even if they differ from Elijah’s own ideas or ours. Of course, that’s really the same thing I’d be doing if he only had one answer instead of every answer. So while I work to embrace the overwhelming ambitions of my little visionary, I am also excited at the possibilities. 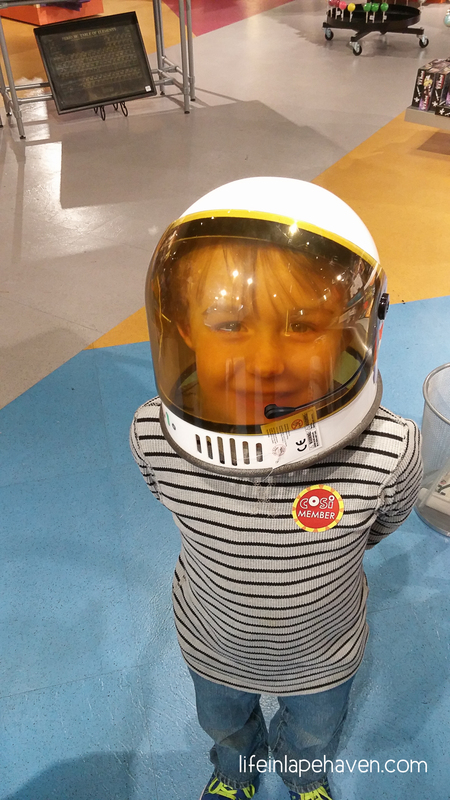 Sure he most likely won’t be an astronaut AND a zookeeper. But with that kind of expectation, confidence, and determination, it’s kind of fun to imagine what he really could be, to wonder at what God has in store for him. As much as I want him to be my little boy forever, I’m also excited to see the “everything” he’ll be when he grows up. 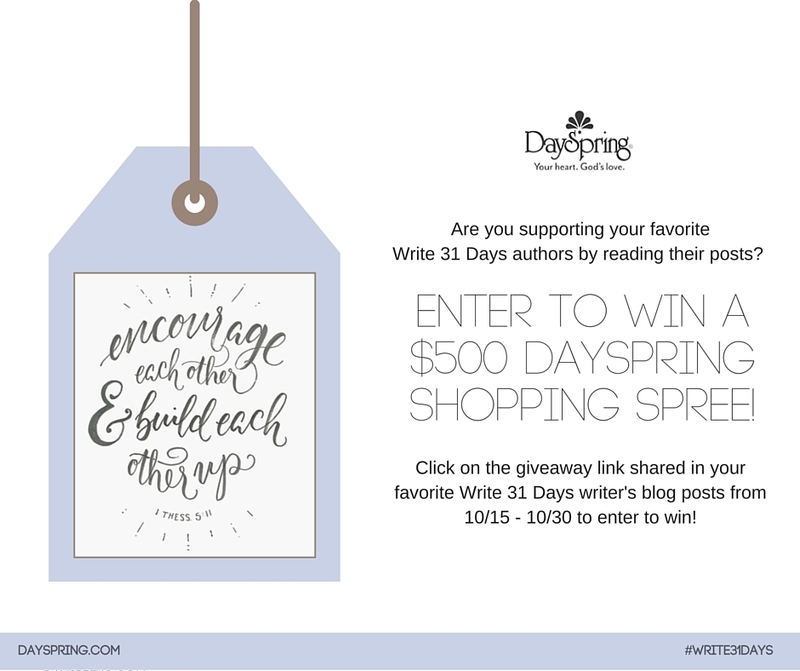 Remember to enter to win a $500 Shopping Spree from DaySpring.com! DaySpring is celebrating all the amazing Write 31 Days READERS who are supporting the nearly 2,000 writers this month! Enter to win a $500 shopping spree by clicking this link and following the giveaway widget instructions. 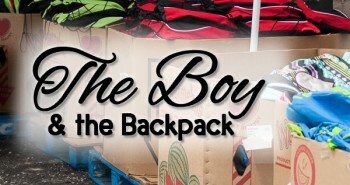 There will be a link at the end of each day’s post from October 15 through October 30. I would love it if one of MY readers won!!! So, good luck and THANK YOU, THANK YOU for reading!